Pour out half of the tomato sauce in the sardines so that it'll not be too wet later. Pour the whole tin of sardines in a large bowl. Mash with a fork. Add in chopped onions, garlic and chillies. Sprinkle some ground black pepper. Crack all eggs into bowl. Mix well. Melt butter in a skillet or pan. Take the already halved baguette and spread a heap of sardine mix on it. Place in hot oil with the spread mixture down. Shallow fry till it browns. Flip to crisp the other side. 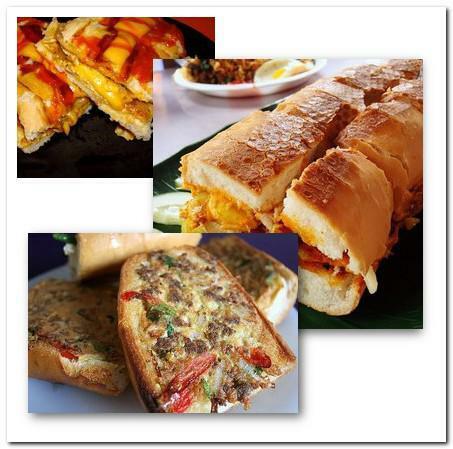 Roti John is an omelet sandwich. It is a popular Malay snack in Singapore and Malaysia. Main ingredients include minced meats, onion, egg, tomato chili sauce and a baguette loaf. “John” is not the inventor of this dish. The name “John” is referring to Caucasians and Westerners! The origin of the 'John' in the name is due to the Western origin of the Baguette and the tomato sauce used in the dish. During British colonization, Caucasians and Westerners were colloquially and affectionately known as 'John' in Malay. This provided the nickname for this snack - Roti John or John Bread.